There are plenty of women's stylish casual walking shoes with rubber soles to satisfy your need to look cute and feel comfortable. Walking shoes should always be lightweight and definitely not as heavy as, say, a basketball shoe. If the shoe is heavy, it becomes uncomfortable to walk in. Since you will be walking on them a lot, you need to be sure they are flexible enough that they won't cause blisters on your feet, but supportive enough so your heels, ankles and feet are not sore. When you are shopping for shoes, simply pick up the shoe and bend the heel and the toe up toward each other to check for flexibility. The heel on a walking shoe should be shorter rather than taller. This supports the natural rolling motion of the foot while walking. Taller heels force you to lift your foot up higher than what feels natural. 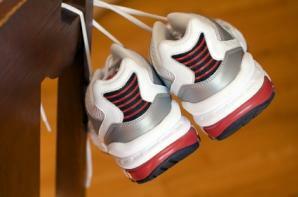 For a low impact activity like walking, you do not need all of the fancy shock absorbers they make for running shoes. Plus, the heels of running shoes tend to be too tall, making them ill suited for walking. So, if you tend to shop in the running shoe section for walking shoes, put the running shoe down (no matter how pretty), turn around and walk directly to the section that reads "walking shoes." Now that you know the basics of what to look for in a walking shoe, it's onto finding women's stylish casual walking shoes with rubber soles. Shoes.com - Check out the stylish walking shoes by Brooks, New Balance and Earth Ambition. Sierra Trading Post - Check out the Allrounder by Mephisto walking shoe, a very stylish choice. Altrec - Reviewers have loved the Rocket Dog brand for stylish and comfortable walking shoes. The Walking Company - Click on the "walking comfort" category and browse through the many cute walking shoes and sandals at The Walking Company. Finish Line - Check out the cute Sketchers walking shoes at Finish Line. Since there is a Finish Line store in just about every mall across the country, you can browse online, pick a pair you like and then go to the store to give them a test walk. Walking is a great way to lose weight, stay in shape and keep your heart healthy. It is so very important to find the right walking shoe, because the wrong shoe can cause injuries to muscles, joints and to the feet themselves. Walking to get and stay fit becomes a moot point if you injure yourself in the process. As far as finding a pair of stylish shoes, well, there aren't any laws against looking good while getting fit, now are there?